NIELIT DEO Recruitment 2016 – Apply Online for 466 Data Entry Operator (DEO) Vacancies: Looking for NIELIT Computer Operator Recruitment? National Institute of Electronics & Information Technology (NIELIT), Lucknow has issued a recruitment notification for the recruitment of Data Entry Operator Posts. Online applications are invited for filling up 466 Data Entry Operator (DEO) vacancies. Age Limit: Refer to notification for more details. Educational Qualifications: Candidates must have passed Intermediate/ Class 12th with typing speed of 15 w.p.m in English and HIndi. Candidates also should have 1 Year diploma in computer. Application Fee: General and other unreserved candidates are required to pay Rs. 500/- as application fee. Selection Process: Selections of candidates will be made on the basis of their performance in written examination and Typing test. 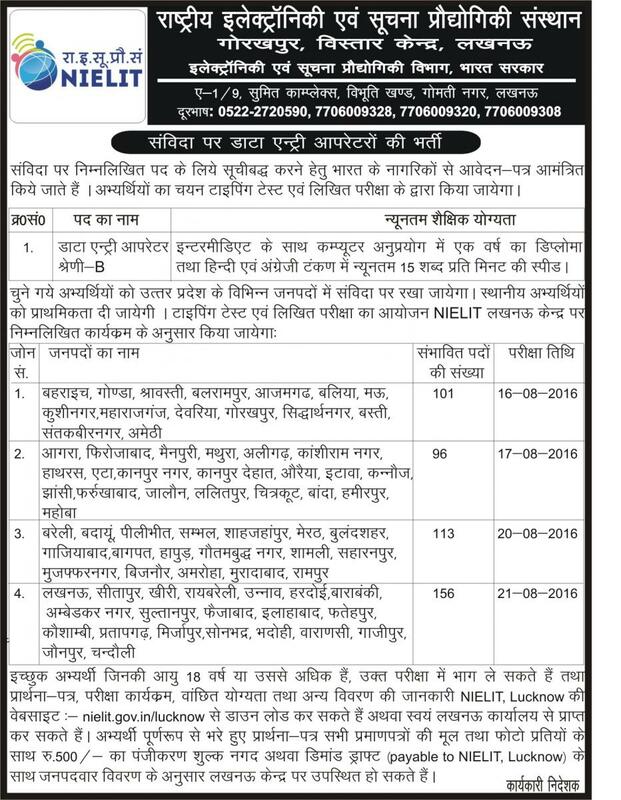 Online Application Form: All those candidates who wish to apply for Data Entry Operator (DEO) posts in National Institute of Electronics & Information Technology, Lucknow (NIELIT), they are required to appear for the type test and written test for their respective district on mentioned dates in the advertisement from 10 AM to 2 PM. More Details: Candidates are strongly advised to read official recruitment notification for detailed information about NIELIT Recruitment for Data Entry Operator (DEO) post regarding age limit, educational qualifications, last date, pay scale, how to apply and online application form.